There is no doubt in my mind that I inherited my love for potatoes from my grandpa. He single-handedly ensured the success of many local potato farmers with his consumption of mashed potatoes alone. Spuds are undeniably woven into Belgium’s patriotic fabric of life. No national or regional dish is truly complete without a side of potato being served alongside it. As such, you can find potato farms all over our western countryside, right alongside cabbage fields, pig farmers and dairy farms. 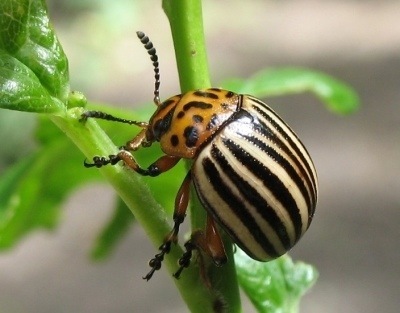 The first Spring after we moved into our new ranch-style house in the Flemish boonies, our yard and patio were overrun by Leptinotarsa Decemlineata, or striped Colorado potato beetles. It was a brand new housing development, and I bet those beetles were probably just as confused and challenged adapting to this new environment as I was. As a little girl, I’d catch them and would create little artificial beetle colonies, complete with tiny dirt pathways and dandelion petal patches and all. It was like 5-star luxury resort-style living, at least in my mind. In hindsight, I was probably feared in Leptinotarsa circles, but my young soul had nothing but the best intentions at heart. The upside is, is that every evening at dusk, I was forced to release the inhabitants of ‘Beetleville’, and watched them scurry off in mass exodus. I wasn’t allowed to keep them as pets and mom demanded I set them free after a long day of forced communal living in an old, scraggly cardboard box. Potatoes have always harbored happy memories for me. I truly love potatoes any which way, but the buttery oven-baked Yukon Golds are by far my favorite. The genius of the recipe below is something I accidentally discovered when I knocked over a glass of freshly squeezed lemon juice I had set aside to make lemonade, and it went everywhere in my tiny apartment kitchen. I will not repeat the choice dialogue that escaped my otherwise proper mouth in that very moment, but will instead thank the cosmic forces for introducing me to ‘lemon potatoes‘. Since that divine intervention, I’ve tweaked the recipe a bit, but let me tell you, the tartness of fresh lemon juice pairs beautifully with the buttery creaminess of these Yukons. I urge you not to lose another minute. Go make these now. – 1.5 lbs of Yukon Gold potatoes, cut into large pieces. Preheat oven to 425F. Butter a large oven dish. In a large bowl, add cubed potatoes with olive oil, water, chopped basil and salt & pepper, and mix with your hands to coat well. Pour into oven dish and cover with aluminum foil. Bake in the hot oven for approx. 15-20 min, until almost tender. In the meantime, combine lemon juice, zest, garlic, melted butter, honey and chopped dill/parsley in small bowl. 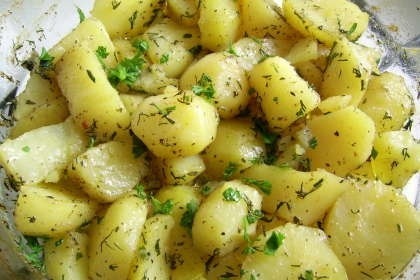 Take potatoes out of the oven, uncover and pour lemon/butter mixture all over the potatoes. Place back in the hot oven and bake uncovered for an additional 20 min until water has evaporated and potatoes are tender. These are so good when served lukewarm, but you could eat them cold or hot as well. I love the idea of these and will have to give them a try! Hooray for kitchen accidents!